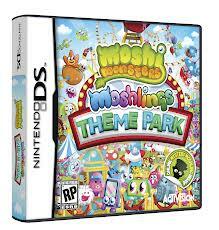 One Mom's Moxie: Moshling Theme Park Nintendo 3DS Game - 4 Hour Flash Giveaway!!! Moshling Theme Park Nintendo 3DS Game - 4 Hour Flash Giveaway!!! Tonight's flash is for Moshling Theme Park Nintendo 3DS Game! 4 hours only 8 pm est until 12am est!